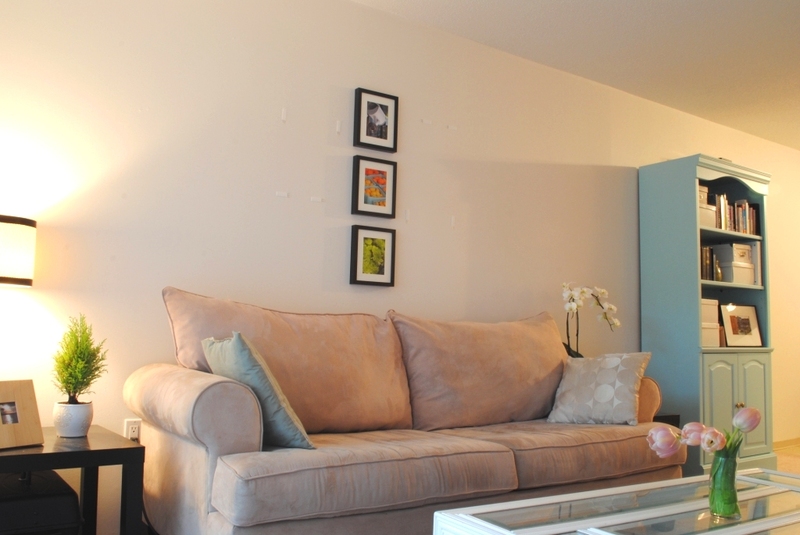 In my recent hutch post, you may have caught a glimpse of our new gallery wall. 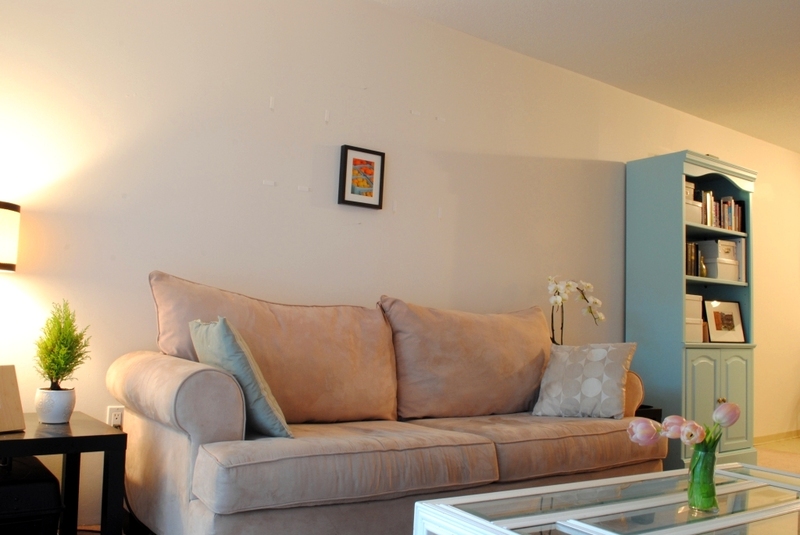 Since our apartment is fairly open, I have a long white wall to fill… 19 ft, to be exact. I got around to hanging some of my prints this week, and it quickly felt so much more like “home”. 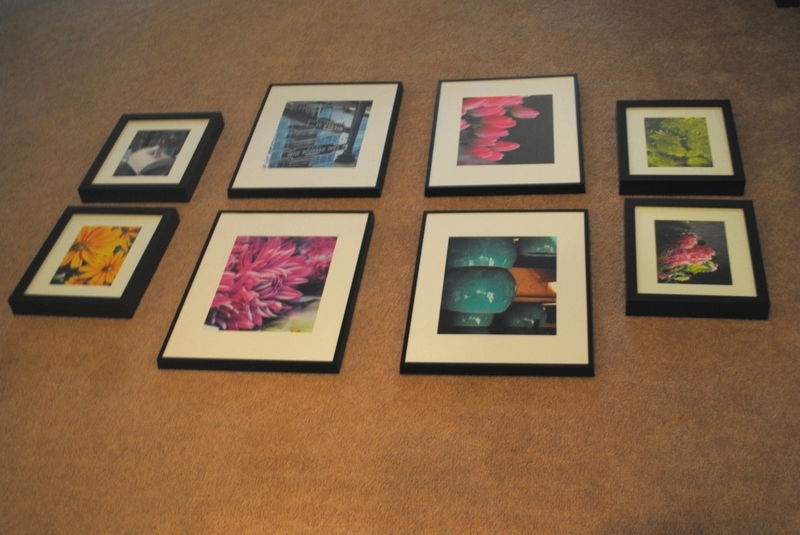 I had both sets of frames from previous places, (4 Ribba frames from Ikea, 5 by 7 photo size and 4 that I bought from a consignment store nearby) but I only thought to put them together here. First, I laid them out to try different formations on the ground. None of them suited me, so I took a look at one of my pins that I’ve been saving for this very reason. I find it much easier to inspire myself from a framework like this (no pun intended) rather than starting from scratch. I love the idea of going for a random assortment like the top left image, but I always end up opting for symmetry. The third one in the top row was a great jumping off point; it just needed some tweaking. 1. I took a photo of the layout as reference, and noted the approximate distance between prints: mine were about 3” apart. (I’ve missed this step before and ended up with pictures far more spread out than I had intended). 2. 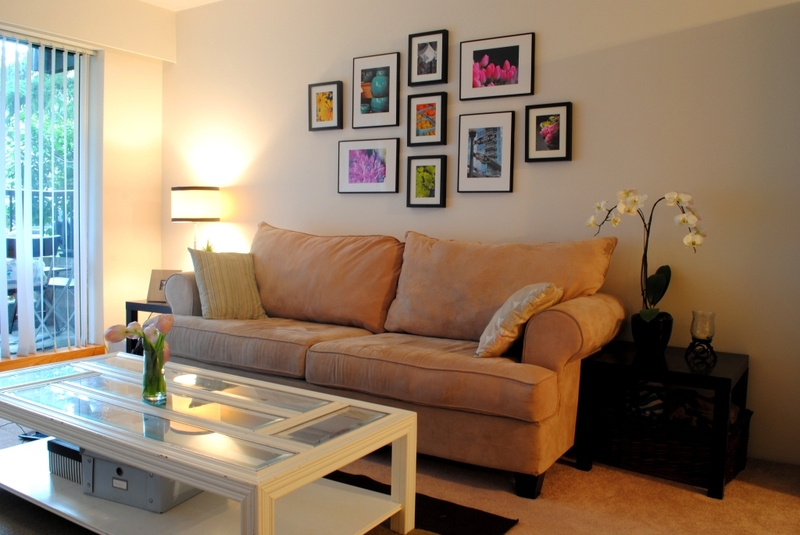 We hung the middle photo at eye level first, centering them between my sofa pillows. I’ve asked Ikea staff if they have anything specifically made to hang these frames (they love making designs that only work with their products), but they don’t. In case you’re facing the same dilemma, I thought I’d share what works for us. 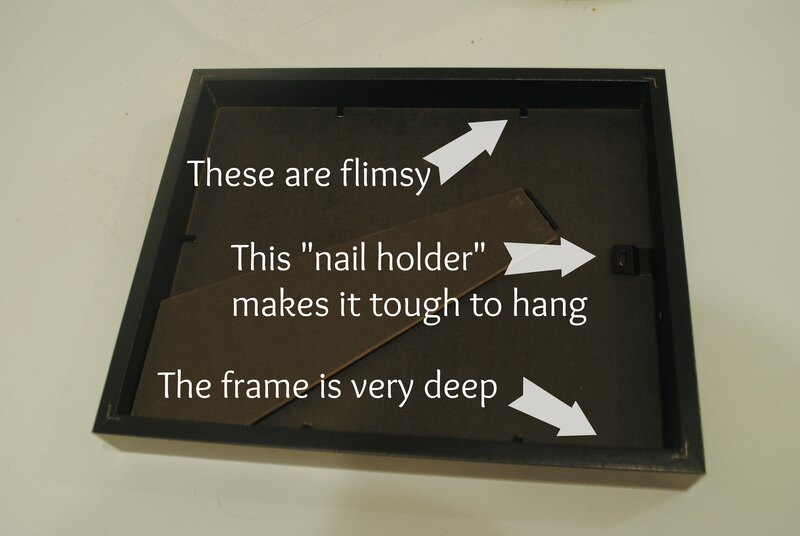 They’re long enough to hold the frame, but narrow enough to fit in the nail “holder”. I nail them in with about an inch to spare. Then, I pull them back out to about an inch and a half: this way, I can see where the nail is going behind my frame, and I can carefully insert them into the holder. Once they’re in place, I push the nail back into the drywall so that the frame is flush with the wall. 3. We hung the top and bottom Ribba frames next. We’ve been picky about using a level and keeping them in an exact straight line in the past, but this time, we just eyeballed it. 4. From there, I worked from the middle outwards. 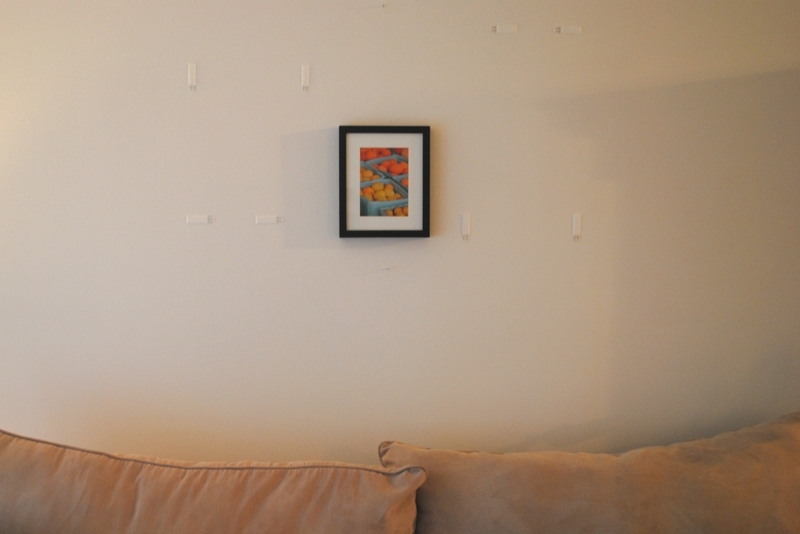 I hung my larger prints around the middle line of photos with command strips. I’ve loved them for a while, and you’ve probably seen them elsewhere in blogland. As much as they can be expensive, I find them much easier since they don’t damage the wall and they’re repositionable. 5. Finally, I hung our last two Ribba frames. I may add a two more to create more balance, but I’m not sure yet. What do you think? Prints: These are my own photos, so I only had the cost of developing. I had a few on hand, but I updated the 8 by 10’s and a few of the 5 by 7’s, so my total here was $35. Frames: Again, most of these were frames I already had. I only added one more frame from Ikea for $7. If you’re curious, my larger frames were $5 each on consignment. I recommend checking out home consignment stores once and a while… You never know when you’ll find a deal! What about you? Anything you’ve taken the time to hang recently? 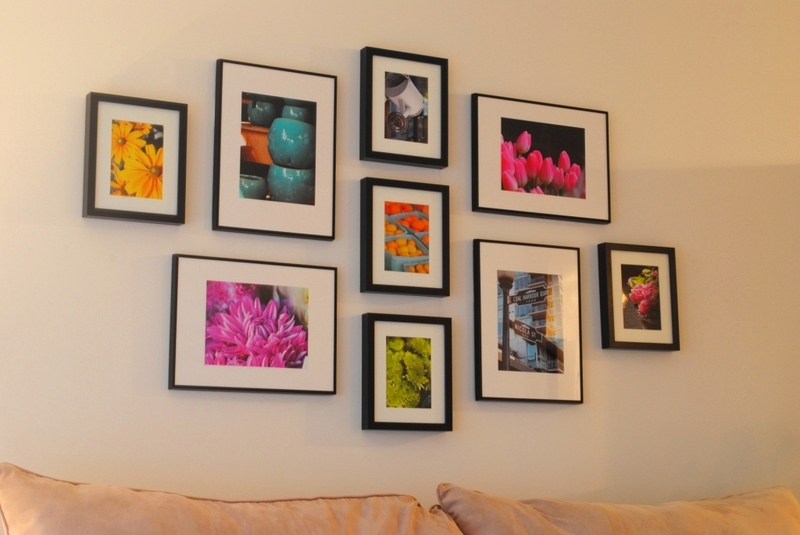 Have you happily displayed any of your own photos? 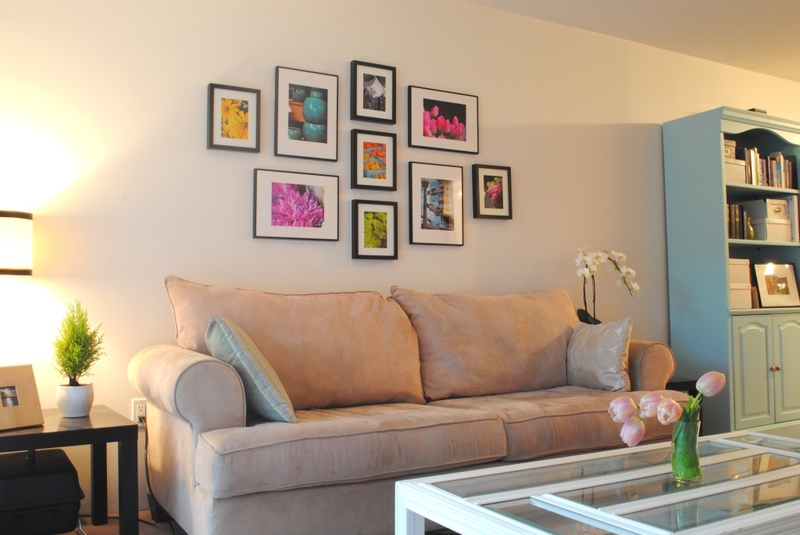 This entry was posted in Decorate and tagged Gallery wall, photography, Ribba frames by Lauren Monique. Bookmark the permalink. 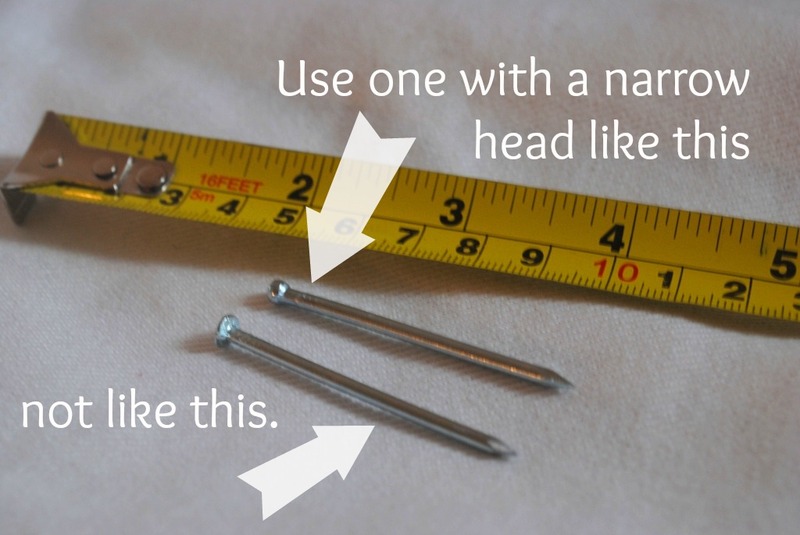 I did not know there would be such things as models for hanging frames, but reading your post, your pin and seeing the results, now I totally get it, and will bookmark this! Maybe for our stairs at EugenieStreet? Merci L’Amour chez nous! Ya, they’re great! I usually don’t have a clear vision of what I want, so they can really help. 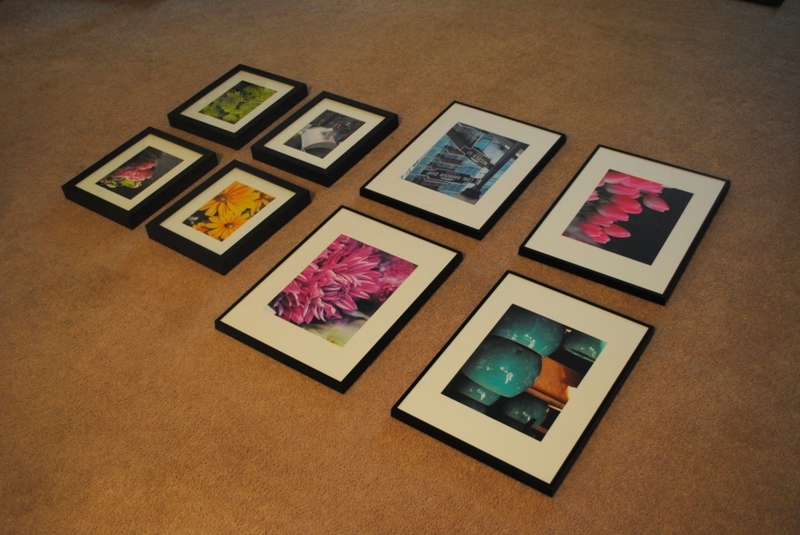 I’ve never seen such a thorough post on hanging art. Excellent! Our current home isn’t suited to a gallery wall, but I’m pinning this for future reference in our next place. It will be so useful!